A special offer to hotels. A single flexible bed base-sofa. Can be used as an independent construction for sleeping. Two bases can be joined using connecting elements to make a double bed base. A base frame is made of flat laminated birch beams connected with UUP 01 (UUP 03) corner nodes, with outer radius 70 mm. Latoflexes used: width 50 mm, set into slat holders LDP 54-05 or their analogs. A set can be completed with matrass holders. 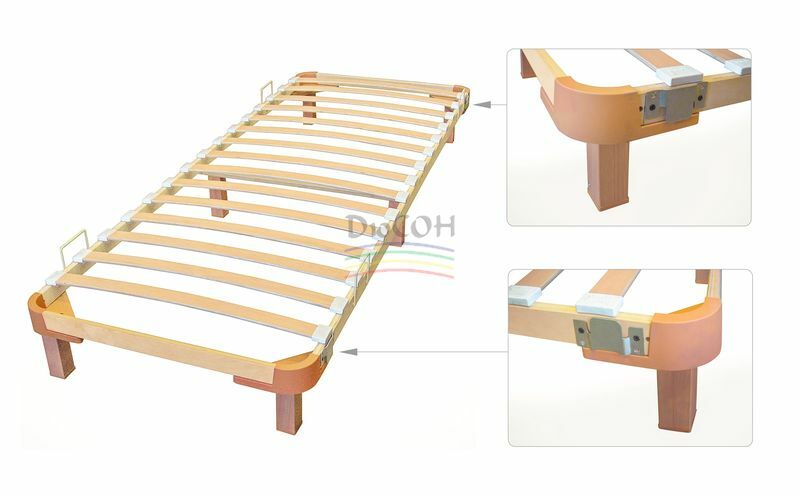 The standard height of a flexible bed base (from bottom to upper surface of slat holder) – 245 mm. The required height is to be discussed with a customer. Some strength properties of the product are even better than the same properties of orthopedic grids made of all- welded profiled metal pipe. Can be used with any types of matrasses. Ортопедические основания или ортопедические решётки? Где купить наши кроватные основания?